After a first, introductory flight at the end of May (which you can read about here) I finally had the right weather for my first actual flight lesson. The wind was calm, temperature around 24 degrees Celsius and clouds were nowhere in sight for the most part and I could not wait to get behind the control column. Before that could happen though, a ground briefing was necessary. My instructor Bob and I spent some time in the classroom before heading out to the plane. In this hour and a half we reviewed the basic principles of flight (how the wings create lift, etc.). Also what the different attitudes the airplane can be in are (nose up, cruise, nose down) and how the stabilator (or in the case of other planes, the elevator) influences them. Other things covered included: the use of the rudder for yaw, proper taxiing procedures in wind, using the natural horizon for level flight, how each of the control surfaces affect the pitch, roll and yaw of the plane, etc. This was all a review of material from ground school, however since I was going to get to practice it right after the lesson it seemed so strange and new that I was happy we covered it all. Once we were finished in the classroom, Bob handed me a list of checklists I will be using from now on. It came in this neat little Peninsulair-branded spiral notebook with a CYHM airport diagram printed on the back. Before I even got into the plane, I completed a full walk around of the Piper. 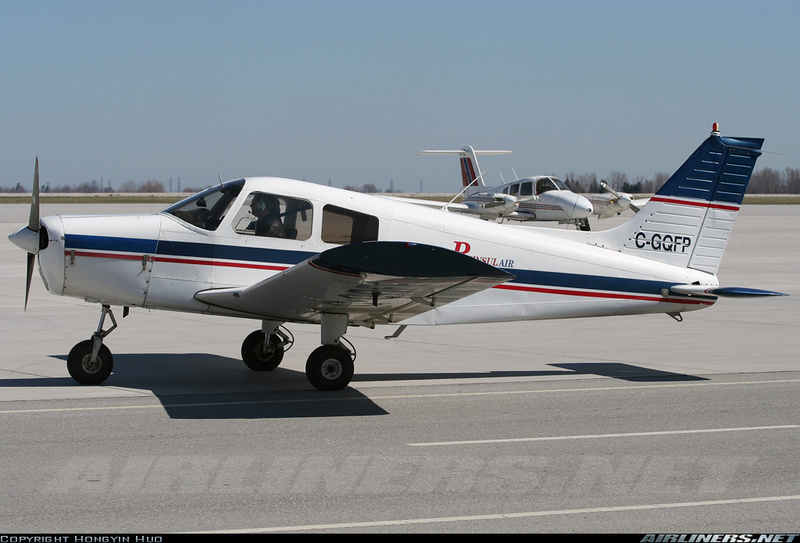 Today’s plane du jour was C-GQEQ, shown below. After this I climbed in the cockpit and pulled out the checklist pad for the pre-engine start up checklist. As the engine fired up, so did my excitement. I was looking forward to leaving the ground, but first there were a few more checks to run. We received clearance to the active runway which was 06, so we proceeded to the apron where Bob walked me through the run up. Taking off was quick and painless: full throttle, rotate at 55 kts. We headed northeast for a bit then turned to heading 210 and went over the Toronto Motorsports Park (which is actually in Cayuga, not very near Toronto). There were a few cars going through the circuit so we went lower to get a better look. We then turned towards Lake Erie and went into the training area for me to practice staying level and maintaining altitude by just looking outside the airplane. The flight was over very quickly, too quickly. I don’t think I will ever get enough of being in the air and I cannot wait until Tuesday when my next lesson is scheduled for, weather permitting. I am hoping to be able to fly 2 or 3 times per week, more if possible, and this should allow me to get my license before the end of the year. Before that though, I am 0.9 hours closer to soloing! Saturday May 24th, 2008 will be a day that I will remember for a long time. It is the day I first went up in a small plane, a Piper Cherokee to be exact. It is the day I began my flight training. A few months ago I signed up for ground school at Toronto Airways. I had been thinking about it for a while, since my house mate in Markham was in the Seneca College Aviation program and we spoke about flying and maneuvers and weather quite often. I have been playing Microsoft Flight Simulator since I first became aware of its existence so you could say I had an interest in flying but I never really looked into it. I completed ground school on April 10 of this year and, since I moved to Hamilton at the end of April, I began looking for flight schools in the Hamilton area. My choices were Spectrum Airways, in Burlington (CZBA) and Peninsulair in Hamilton (CYHM). I decided to go with Peninsulair since it was closer, I would be flying out of an international airport so I’d get experience with the big boys and also I like the look of the Cherokee. Saturday was my introductory flight, a 30 minute flight preceded by a discussion of licensing goals and requirements. Since I have already completed ground school, written and passed my PSTAR, radio license and held a valid Category 3 medical, the discussion was cut short and my instructor, Bob, and myself headed out to the plane. Ok we’re cleared to taxi. See Bravo over there, take us there. Alright let’s taxi into position. I’m gonna close the door here. Alright throttle it up and get this plane in the air. He let me do the take off! Once off the ground, the feeling was unreal. So much freedom to move in three dimensions. It was amazing. I turned right to follow the 403E until I got to Princess Point then turned right again. Went over the Skyway bridge and followed the Lake Ontario shore line until I was over Wild Waterworks. It was a beautiful day and there were many boats on the lake. The colour of the water was a spectacular blue with boats carving white streaks as they passed through. I turned right once again and passed over Devil’s Punchbowl and the escarpment on the way back to the airport. Bob let me do the approach (which was awful in terms of approaches) and when the plane wouldn’t go down any more, he took control and landed us. My first flight was over, the next one is on Saturday. I can’t wait! If you’re trying to remember all those different types of clouds (say if you’re studying for a pilot’s license) here is a great reference for you: The Cloud Appreciation Society. These people are really into clouds, and I mean REALLY. There are photo galleries and forums, cloud news, poetry about clouds and much more. With over 12,000 cloudspotters you’re sure to find information about any type of cloud you want. They “love clouds, [they’re] not ashamed to say it and [they’ve] had Enough of people moaning about them.” You can read the society’s manifesto and check out some really cool pictures afterwards. Two months ago I began my flight training with Toronto Airways at Buttonville Airport (CYKZ). I guess “flight” training isn’t exactly correct since this was actually the ground school preceding the actual flying. Over the course of eight weeks, the course covered everything from the basics of flight, to meteorology, aircraft engines and navigation. The instructors went over the important parts and left it up to the students to fill in the blanks since the amount of information is enormous in most sections. These requirements are detailed in CARs 421.26. The only things standing between me and the PPL are the written exam and the flight training hours. I have decided to fly out of Hamilton’s John C. Munro International Airport (CYHM) with Peninsulair. It was a toss-up between Hamilton airport and Burlington airpark (CZBA), however in the end Hamilton won since I can just take the bus up to the airport, whereas to get to CZBA I would need a car. Peninsulair has a fleet of Piper PA28-140’s which they use for training. The plane is a single engine, single door, two or four person aircraft. I can’t wait to get behind the yoke of one of these and take it out for a spin!